A promotional copy is a recording that is sent for free to radio stations and DJs to get the word out about a new 45 that will soon enter stores. Promo copies typically feature different labels, often with white backgrounds and “PROMO COPY” or “DJ COPY” stamped across the front. These copies are not initially intended to be sold, but over time they tend to become sought-after collector’s items. We have 3 of them today for your listening pleasure. Label Owner: Henry “Juggy Murray” Jones. 271 W. 125th St, New York, NY. 725 Riverside Dr, Suite 4C, New York, NY. 265 West 54th St, New York, NY (1957-1970). 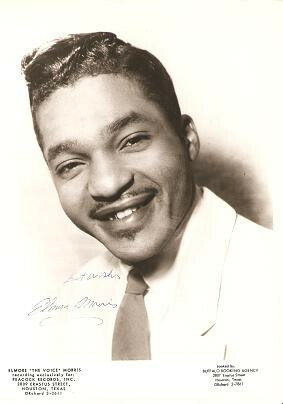 Elmore Morris, in addition to being a solo artist, was in a group called Elmore Morris and The Spinners. With the spinners, he only released 1 45, but alone, he released 4. Of those 4, 3 were with Peacock Records, and the other 1 was with Crackerjack Records, which is what we’re writing about today. What’s more, this group flew so far under the radar that they don’t have even a Wikipedia page to their name. All we have to go off of is a small autographed photo of Elmore that dubs him “Elmore “The Voice” Morris. “Before I Turned My Back on You” is much, much more energetic than “It Seemed Like Heaven to Me,” which does much to explain why the record’s sides were switched for the final release. Elmore earns his “The Voice” moniker with an energetic, upbeat tune that showcases his impressive vocal range. 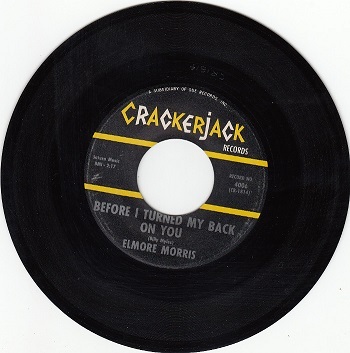 The track has a group of backup singers, but they aren’t credited as Elmore’s Spinners, so we can only assume that they are some of Crackerjack’s stock background artists. The song is great enough on it’s own, but the trumpet solo in the middle really solidifies this piece’s place as a feel-good tune. “It Seemed Like Heaven to Me” is an interesting piece because of how small of a role that the background instruments play. In the previous song, Elmore shares the stage with a trumpet that carries the tune’s melody along behind him. This song, however, has quiet instruments that play at a slow tempo. Frequently there are short pauses between instruments, leaving only Elmore’s voice and drums in the song. This has the effect of highlighting Elmore’s great voice as well as building tension for where Elmore and the instruments crescendo together into the chorus. As before, there are background singers in the track, but they don’t appear to be the Spinners that Elmore would later work with. Label Owner: Sid Talmadge. 2580 W. Pico, Los Angeles, CA. (1958-1980). Mike & The Censations is actually a family band, and, unlike many others we’ve reviewed, they’ve been active for quite some time. They even appeared on some compilations as recently as 2011! The band is made up of Mike James Kirkland and his two brothers, Robert and Walter. They got their start in Yazoo City, Mississippi, where they starting singing as a local gospel act. Mike and Robert would later go on to start their own label, Bryan Records. 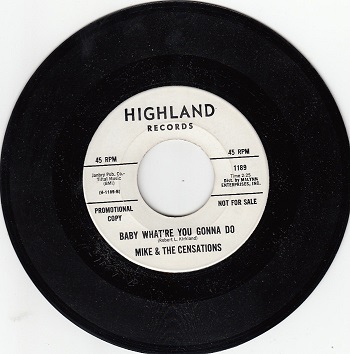 Interestingly enough, the group’s first record, which made the top 50 of the R&B charts that year, came as the result of a bet Mike made with his brother that he could make a record as good as any in Motown. The socially conscious lyrics of the group led to some thinking of Mike James as an underground Marvin Gaye. John Legend covered Mike James’ “Hang On In There” back in 2011, which brought a fresh wave of ears to Mike & The Censations. The best way to describe “Baby What’re You Gonna Do” is “smooth,” especially after the pounding voice of Elmore Morris. Mike and his brothers have calm, relaxing voices that give this song a soothing feel. The xylophone in the background enhances this effect, and its mellow chimes ring out like church bells. “Don’t Sell Your Soul” is much bluesier than the other track. It stands out not only because of its 12-bar blues progression and slow buildup, but because it’s one of those rare blues songs that doesn’t feature a woman as the topic. Instead, it’s a man reflecting on some advice given to him by his father—specifically, that the son should never “sell his soul.” The father tells his son to be good to others and to create his own change. This socially conscious message of the song pairs well with the brothers’ harmonizing voices. Label Owner: Bill (Hoss) Allen. 1 Hermitage Ave, Nashville, TN. 1719 West End Building, Nashville, TN. (1962-1965). 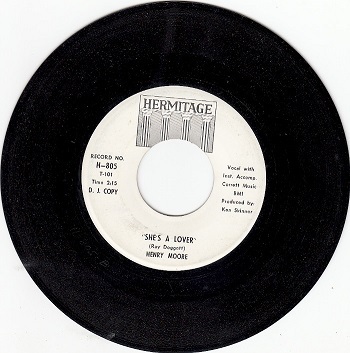 “She’s a Lover” stands out as a rock ‘n’ roll tune among a sea of soul and blues. Of course, the blues undertone present in all rock can be heard beneath the surface, but readers of our blog will agree that this tune has a decidedly less soul-y feel than others we’ve written about. The only recording of “She’s A Lover” you can find for free is a tinny, grainy sounding recording of someone holding up a cellphone to a rotating turntable. In it, Moore’s already nasally voice takes on an almost comical pitch because of the phone’s poor microphone quality. All this to say, you won’t be able to hear this song in all it’s glory unless you order it from us. “Let the World End Tomorrow” doesn’t have so much as a grainy YouTube video to its name. It was described by one listener as “a pleasant if unremarkable beat ballad.” Think you’d agree? There’s only one way to find out! We provide a simple online ordering form for all of our records. Enter your billing and shipping information, provide details about the record you’re requesting, hit submit, and sit back.